When muddy sediments are buried and compacted for a long time, they form shale. When shale is buried deeper, for a longer time, and heated by the Earth's crust, it forms slate. The qualities of shale and slate vary with the makeup of the original sediments, the degree of compaction, the amount of heat and the length of time involved. The sediments that form shale and slate originate from weathering on higher ground, and they're carried by erosion to the place of deposition. Among the sediments, cobblestones fall out of the water first, then gravels, then sands, leaving only very fine particles of clay and some organic material. A muddy river illustrates this; the clouding is called turbidity. The U. S. EPA says a single storm event can load a river with as much as half of the river's total annual load of sediment. The water carries these fine particles until it slows into still water such as a lake, river delta or continental shelf. The particles settle to the bottom, where over time they're buried by more sediments. Later they may also be overlain by sandstone or limestone. The weight of the overlying material, over millions of years, compacts the sediments into shale. Shale is bedded in thin layers as the sediment particles are flattened into parallel sheets, which is called "foliation." Poorly-compacted shale is easily pulled apart by hand. Geology.com describes how shale can have different colors, depending on what's in the original mix of sediments. Organic content of just a few percent produces a black shale; calcareous minerals turn shale gray or light gray; and iron oxide or iron hydroxide can cause reddish, yellow or brown colors. 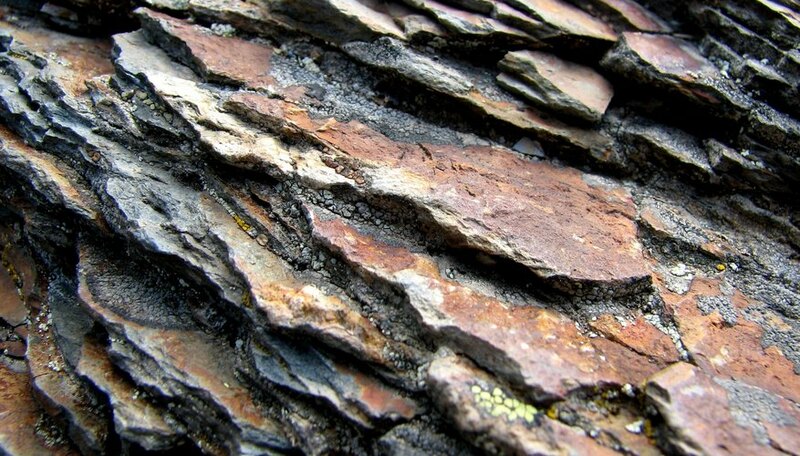 Slate is one stage in the metamorphosis of shale, a sedimentary rock, to gneiss, a metamorphic rock. Slate can also form from volcanic rock. In slate, the heated and compacted minerals slowly flow and align themselves perpendicular to the axis of compression, to create "cleavage," which is the tendency of the rock to break along straight lines. Like shale, slate has various colors; sometimes it is streaked by the flowing of the minerals. Unlike shale, slate is hard enough to be useful as a structural material in its intact form. Billiards tables use it as a flat, inflexible base for a playing surface. It's cut into pieces for paving walkways, and for flooring. Because slate can be split along its cleavage planes, it has traditionally been used to make durable shingles for roofs. Shale is too soft for such applications, but as National Geographic explains, some kinds of shale have enough organic hydrocarbons, called kerogen, to make "oil shale," a potential energy source. An ecological blogger, technical writer and trainer, Alex Silbajoris also leads a nonprofit watershed group. He is an avid gardener and cook. He holds a bachelor's degree in English and a master's degree in journalism, from The Ohio State University. Other studies include geology and biological sciences. How Are River Rocks Formed? Silbajoris, Alex. "How to Tell the Difference Between Shale and Slate." Sciencing, https://sciencing.com/tell-difference-between-shale-slate-8697556.html. 25 April 2017. Which Type of Sedimentary Rock Is Formed From Fragments of Minerals or Rocks? How Does Sediment Affect the Ecosystem?